Several cm of snow in Gush Etzion, light snowfall in J'lem, as Israel Electric Corporation marks all-time high in electricity consumption. 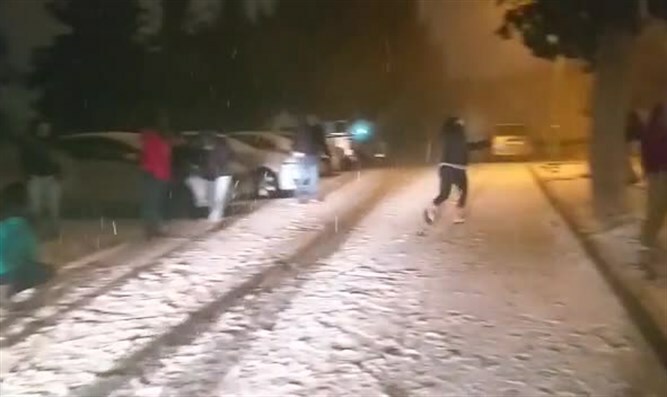 A winter storm struck Israel Wednesday, bringing rain and snow to different parts of the country. Heavy rain began in the north early Wednesday afternoon before spreading to the center. Snow plowing teams have been put on alert in Jerusalem and the Golan heights. According to the Meteorological Service, the snow in the northern mountains will be light, but Jerusalem and the central mountains may see significant snowfall. Earlier, snow began to fall in Gush Etzion while hail was reported in Jerusalem. Light snow has recently begun to fall in Jerusalem. Strong winds were recorded throughout the country even before the rains began, causing trees to fall in the south and center. Highway 232 was blocked between Hodaya Junction and Kibbutz Nitzanim due to the collapse of several trees on the road. Rescue units throughout the country were also on heightened alert for the storm. The Israel Electric Corporation reported that this evening electricity electricity consumption reached an all-time high. At its peak, electricity consumption stood at 13,058 megawatts.